They say we eat with our eyes first. But what happens when an otherwise delicious meal gets set down in front of us, only to realize that it’s been jammed into the wrong serving contrivance? If it’s a bowl of ramen, shoving that rectangle into a round bowl can only have crumbly, unappetizing results. It’s a wonder that anybody eats the stuff. How has rectangle-ramen survived in a round-bowl-world for so long? 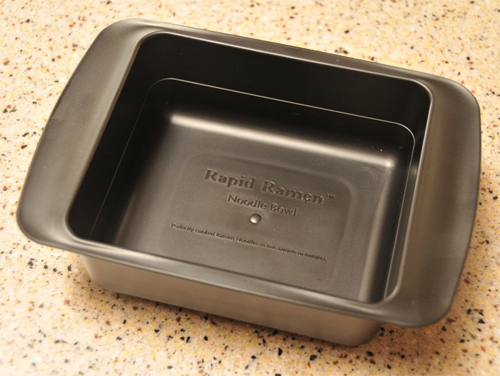 Well, it’s no matter because the Rapid Ramen Cooker is here to save the day. There is no great secret here to the Rapid Ramen bowl; it just happens to be a bowl designed to perfectly fit a packet of the dried noodles. No longer must we wade through a crumbled jumble of dried noodles. Just pop the noodle cake into the bowl, fill to the water line and nuke it for about 4 minutes. Thanks to the shape of the bowl, the result should be evenly cooked noodles without any hazardous sharp edges protruding out. See? It’s safe too! Finally, eating ramen no longer must be like forcing a square peg into a round hole. Speaking of, it is also available as: 4-Family Pack Rapid Ramen Cookers . So, yes, even the black sheep of the family can join in the delicious, dried noodle fun!